The New York range of frames offers outstanding value for money. Manufactured to an unusually high standard for a budget frame, this range offers a lightweight option for displaying a favourite photo. The narrow edge of the frame is slightly rounded for a softer feel and is approximately half an inch deep from the front to back and a quarter on an inch side to side. 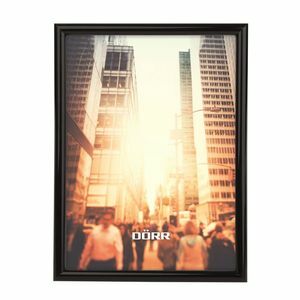 The use of a narrow border ensures that the frame doesn’t detract from the photo inside and the strong plastic surround of the frame has a superb finish. Manufactured in a wide range of bright vibrant colours as well as the more standard black, white and steel, the colours are coated onto the plastic in a smooth flawless finish. The MDF backboard on the New York range of frames is fitted with silver metal retaining clips on each edge which simply press down and rotate out from under the rear edge of the frame and then rotate back into place once the backboard is re-fitted thereby securing the photo in place. Each clip has a serrated edge so can be used as a hanging option allowing the frames to be hung horizontally or vertically.